Not sure what I'm doing wrong here... trying to print the index of an array to the console but getting the wrong number. The array stores a reference to the UI, not the String name. I'm trying to get familiar with using an index to show/hide controls, but it's not clicking in my brain yet... Also my first time using radiogroups. As a test, I have a simple instrument with 2 samplers. 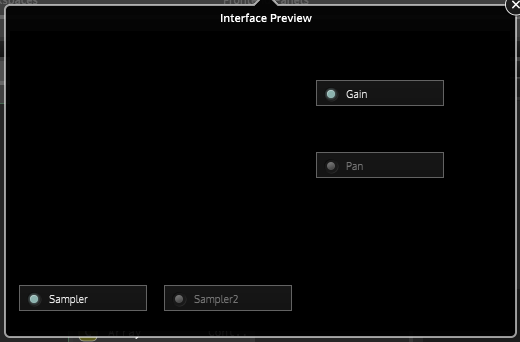 The user interface has buttons (in radiogroup) to select each sampler, and a second set of buttons (in separate radiogroup) to show/hide controls of the samplers. All buttons have been put into associated arrays, I've created a Callback function for the buttons, and I'm using the onControl section to show/hide content. What I'm attempting to do is use the index of my SamplerSelectButtonArray to show/hide knobs in the GainSliderArray or PanSliderArray. This line var y = ControlSelectButtonArray.indexOf(component); You should use local rather than var. This line GainSliderArray.showControl(index); Where is index coming from? Is that only available in my buttonCallback function? @dustbro Ya, that's why it's local post a HISE snippet, I think I will be able to help you more then. Does anything look whack enough to bring down HISE? I've gotten much closer to the goal.... just one thing left. Switching between Sampler1 and Sampler2 doesn't update my display until I select the Gain/Pan button. Any suggestions? @christoph-hart The build is May3 2018. I'll update to the latest today. @dustbro The latest is in the develop branch but there might be bugs. @d-healey Overall functionality of the newest version is quite more stable than what I was using. Keeping my eyes open for bugs as you suggested.